← Want to Get Emails When We Make a New Post? This is the first of several installments on ultra low cost desert shelters. The idea came from reading Phillip Garlington’s website at Rancho Costa Nada (“the cost nothing ranch”), where he tells his story of chucking a regular 9-5 job and creating a new life in the desert. Economic woes are driving millions of people out of the economy, many of whom become economic refugees with no place else to go except the cheapest land available – the desert. As a result, desert communities are springing up throughout the southwest US deserts. There’s an obvious lack of suitable shelter, and that’s why I got involved. Most of these desert dwellers are living in tents that quickly succumb to the wind or in old trailers and motor homes that are unbearably hot and uncomfortable, and create an eyesore on the environment. 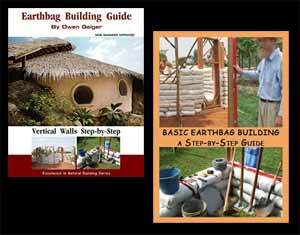 I knew there had to be a better way, and so I set out to create a series of desert shelters that anyone could build with little or no training, using sand bags, primarily salvaged materials and some store bought supplies. I set an upper limit of $300 per shelter. 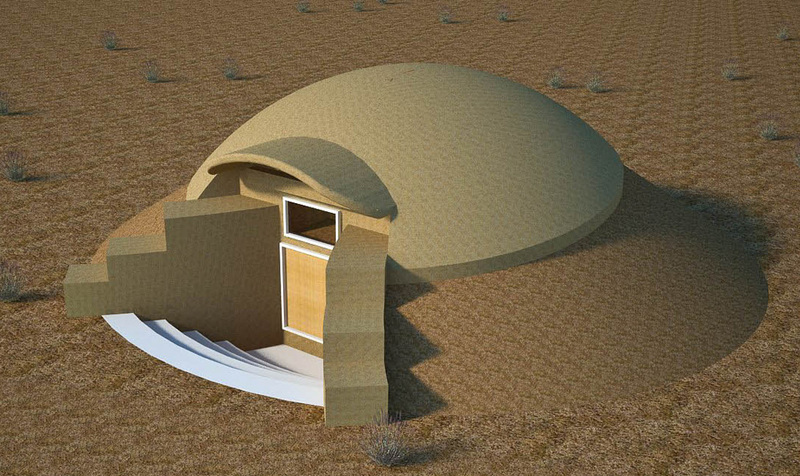 The Desert Dome Shelter has 78 square feet living space and is designed for simplicity of construction using sand and sand bags as the main building materials. Vertical sand bag walls are stacked in a circle since sand-filled bags would slump and collapse if stacked in a dome shape. 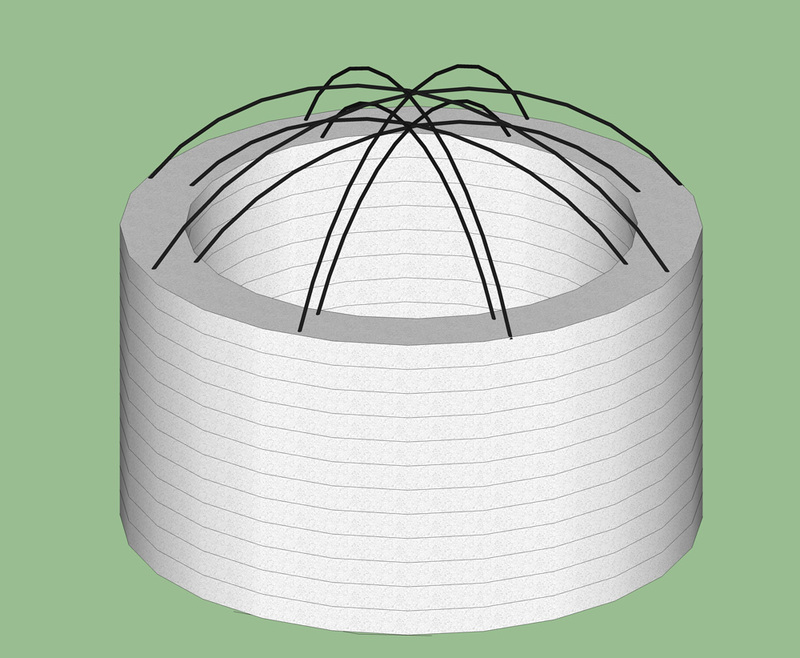 The domed roof is made of a double layer of ½” steel rebar bent into a curve. Top and bottom surfaces are covered in doubled chicken mesh and plaster, and the space between filled with insulation such as foam packaging peanuts. Building two feet into the ground and berming the sides provides greater comfort and protection from harsh winds. A two foot raised threshold helps prevent flooding, and with added lip, keep snakes out (Phil’s idea). Air flows through vents in the back of the structure and out the tilt-open window above the door. Internal temperature is projected to be 15 degrees cooler than the outside air. Stay tuned. I’ll be publishing the whole set of designs over the next few days. Then everything will be combined into a free PDF. – easier construction: top of domes are a little tricky where the bags curve in on the top. – better protects domes in rainy/snowy climates: easy to create a roof overhang with the ferrocement (make a lip that projects beyond the wall). How is the rebar “tied down” to the roof? Are these arcs pre-bent or bent as they’re put on the bags? Pound the rebar into the earthbags, bend into desired curve and then tie to other half (other piece of rebar on the opposite side) with galvanized wire. 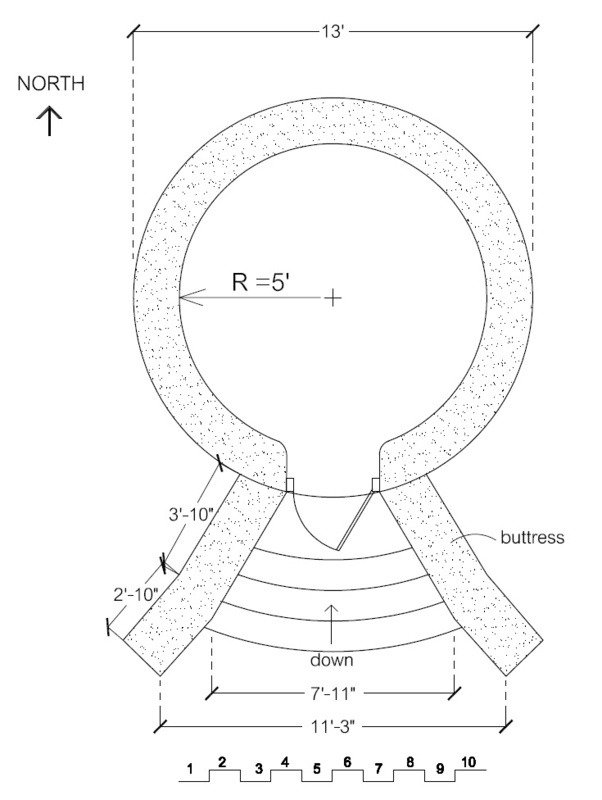 Allow 18″ or so overlap where rebar pieces join. This is a shelter for desert regions with very low rainfall. You’re not likely to get 1-2 feet of rain all of a sudden, right? I designed one of these a long time ago when I found formworks building in Durango Colorado. Hat’s off to you. It comes down to environment. Keep up the good work. If you want to go slightly bigger they are rebar connectors they sell that would help your hoop lengthen. My design was 15′ diameter with 9′ ceilings which would allow a loft.